Not to be confused with frame rate. "Slow film" redirects here. For the genre of films, see slow cinema. Film speed is the measure of a photographic film's sensitivity to light, determined by sensitometry and measured on various numerical scales, the most recent being the ISO system. A closely related ISO system is used to describe the relationship between exposure and output image lightness in digital cameras. The first known practical sensitometer, which allowed measurements of the speed of photographic materials, was invented by the Polish engineer Leon Warnerke – pseudonym of Władysław Małachowski (1837–1900) – in 1880, among the achievements for which he was awarded the Progress Medal of the Photographic Society of Great Britain in 1882. It was commercialized since 1881. The Warnerke Standard Sensitometer consisted of a frame holding an opaque screen with an array of typically 25 numbered, gradually pigmented squares brought into contact with the photographic plate during a timed test exposure under a phosphorescent tablet excited before by the light of a burning magnesium ribbon. The speed of the emulsion was then expressed in 'degrees' Warnerke (sometimes seen as Warn. or °W.) corresponding with the last number visible on the exposed plate after development and fixation. Each number represented an increase of 1/3 in speed, typical plate speeds were between 10° and 25° Warnerke at the time. His system saw some success but proved to be unreliable due to its spectral sensitivity to light, the fading intensity of the light emitted by the phosphorescent tablet after its excitation as well as high built-tolerances. The concept, however, was later built upon in 1900 by Henry Chapman Jones (1855–1932) in the development of his plate tester and modified speed system. Another early practical system for measuring the sensitivity of an emulsion was that of Hurter and Driffield (H&D), originally described in 1890, by the Swiss-born Ferdinand Hurter (1844–1898) and British Vero Charles Driffield (1848–1915). In their system, speed numbers were inversely proportional to the exposure required. For example, an emulsion rated at 250 H&D would require ten times the exposure of an emulsion rated at 2500 H&D. The methods to determine the sensitivity were later modified in 1925 (in regard to the light source used) and in 1928 (regarding light source, developer and proportional factor)—this later variant was sometimes called "H&D 10". The H&D system was officially accepted as a standard in the former Soviet Union from 1928 until September 1951, when it was superseded by GOST 2817-50. The Scheinergrade (Sch.) system was devised by the German astronomer Julius Scheiner (1858–1913) in 1894 originally as a method of comparing the speeds of plates used for astronomical photography. Scheiner's system rated the speed of a plate by the least exposure to produce a visible darkening upon development. Speed was expressed in degrees Scheiner, originally ranging from 1° Sch. to 20° Sch., where an increment of 19° Sch. corresponded to a hundredfold increase in sensitivity, which meant that an increment of 3° Sch. came close to a doubling of sensitivity. The system was later extended to cover larger ranges and some of its practical shortcomings were addressed by the Austrian scientist Josef Maria Eder (1855–1944) and Flemish-born botanist Walter Hecht [de] (1896–1960), (who, in 1919/1920, jointly developed their Eder–Hecht neutral wedge sensitometer measuring emulsion speeds in Eder–Hecht grades). Still, it remained difficult for manufactures to reliably determine film speeds, often only by comparing with competing products, so that an increasing number of modified semi-Scheiner-based systems started to spread, which no longer followed Scheiner's original procedures and thereby defeated the idea of comparability. Scheiner's system was eventually abandoned in Germany, when the standardized DIN system was introduced in 1934. In various forms, it continued to be in widespread use in other countries for some time. The DIN system, officially DIN standard 4512 by Deutsches Institut für Normung (but still named Deutscher Normenausschuß (DNA) at this time), was published in January 1934. It grew out of drafts for a standardized method of sensitometry put forward by Deutscher Normenausschuß für Phototechnik as proposed by the committee for sensitometry of the Deutsche Gesellschaft für photographische Forschung since 1930 and presented by Robert Luther [de] (1868–1945) and Emanuel Goldberg (1881–1970) at the influential VIII. International Congress of Photography (German: Internationaler Kongreß für wissenschaftliche und angewandte Photographie) held in Dresden from August 3 to 8, 1931. A box of Agfacolor Neu with the instruction "expose as 15/10° DIN" (in German). As in the Scheiner system, speeds were expressed in 'degrees'. Originally the sensitivity was written as a fraction with 'tenths' (for example "18/10° DIN"), where the resultant value 1.8 represented the relative base 10 logarithm of the speed. 'Tenths' were later abandoned with DIN 4512:1957-11, and the example above would be written as "18° DIN". The degree symbol was finally dropped with DIN 4512:1961-10. This revision also saw significant changes in the definition of film speeds in order to accommodate then-recent changes in the American ASA PH2.5-1960 standard, so that film speeds of black-and-white negative film effectively would become doubled, that is, a film previously marked as "18° DIN" would now be labeled as "21 DIN" without emulsion changes. Originally only meant for black-and-white negative film, the system was later extended and regrouped into nine parts, including DIN 4512-1:1971-04 for black-and-white negative film, DIN 4512-4:1977-06 for color reversal film and DIN 4512-5:1977-10 for color negative film. On an international level the German DIN 4512 system has been effectively superseded in the 1980s by ISO 6:1974, ISO 2240:1982, and ISO 5800:1979 where the same sensitivity is written in linear and logarithmic form as "ISO 100/21°" (now again with degree symbol). These ISO standards were subsequently adopted by DIN as well. Finally, the latest DIN 4512 revisions were replaced by corresponding ISO standards, DIN 4512-1:1993-05 by DIN ISO 6:1996-02 in September 2000, DIN 4512-4:1985-08 by DIN ISO 2240:1998-06 and DIN 4512-5:1990-11 by DIN ISO 5800:1998-06 both in July 2002. The film speed scale recommended by the British Standards Institution (BSI) was almost identical to the DIN system except that the BS number was 10 degrees greater than the DIN number. Before the advent of the ASA system, the system of Weston film speed ratings was introduced by Edward Faraday Weston (1878–1971) and his father Dr. Edward Weston (1850–1936), a British-born electrical engineer, industrialist and founder of the US-based Weston Electrical Instrument Corporation, with the Weston model 617, one of the earliest photo-electric exposure meters, in August 1932. The meter and film rating system were invented by William Nelson Goodwin, Jr., who worked for them and later received a Howard N. Potts Medal for his contributions to engineering. The company tested and frequently published speed ratings for most films of the time. Weston film speed ratings could since be found on most Weston exposure meters and were sometimes referred to by film manufactures and third parties in their exposure guidelines. Since manufactures were sometimes creative about film speeds, the company went as far as to warn users about unauthorized uses of their film ratings in their "Weston film ratings" booklets. The Weston Cadet (model 852 introduced in 1949), Direct Reading (model 853 introduced 1954) and Master III (models 737 and S141.3 introduced in 1956) were the first in their line of exposure meters to switch and utilize the meanwhile established ASA scale instead. Other models used the original Weston scale up until ca. 1955. The company continued to publish Weston film ratings after 1955, but while their recommended values often differed slightly from the ASA film speeds found on film boxes, these newer Weston values were based on the ASA system and had to be converted for use with older Weston meters by subtracting 1/3 exposure stop as per Weston's recommendation. Vice versa, "old" Weston film speed ratings could be converted into "new" Westons and the ASA scale by adding the same amount, that is, a film rating of 100 Weston (up to 1955) corresponded with 125 ASA (as per ASA PH2.5-1954 and before). This conversion was not necessary on Weston meters manufactured and Weston film ratings published since 1956 due to their inherent use of the ASA system; however the changes of the ASA PH2.5-1960 revision may be taken into account when comparing with newer ASA or ISO values. Prior to the establishment of the ASA scale and similar to Weston film speed ratings another manufacturer of photo-electric exposure meters, General Electric, developed its own rating system of so-called General Electric film values (often abbreviated as G-E or GE) around 1937. Film speed values for use with their meters were published in regularly updated General Electric Film Values leaflets and in the General Electric Photo Data Book. General Electric switched to use the ASA scale in 1946. Meters manufactured since February 1946 are equipped with the ASA scale (labeled "Exposure Index") already. For some of the older meters with scales in "Film Speed" or "Film Value" (e.g. models DW-48, DW-49 as well as early DW-58 and GW-68 variants), replaceable hoods with ASA scales were available from the manufacturer. The company continued to publish recommended film values after that date, however, they were then aligned to the ASA scale. The ASA scale is a linear scale, that is, a film denoted as having a film speed of 200 ASA is twice as fast as a film with 100 ASA. The ASA standard underwent a major revision in 1960 with ASA PH2.5-1960, when the method to determine film speed was refined and previously applied safety factors against under-exposure were abandoned, effectively doubling the nominal speed of many black-and-white negative films. For example, an Ilford HP3 that had been rated at 200 ASA before 1960 was labeled 400 ASA afterwards without any change to the emulsion. Similar changes were applied to the DIN system with DIN 4512:1961-10 and the BS system with BS 1380:1963 in the following years. In addition to the established arithmetic speed scale, ASA PH2.5-1960 also introduced logarithmic ASA grades (100 ASA = 5° ASA), where a difference of 1° ASA represented a full exposure stop and therefore the doubling of a film speed. For some while, ASA grades were also printed on film boxes, and they saw life in the form of the APEX speed value Sv (without degree symbol) as well. ASA PH2.5-1960 was revised as ANSI PH2.5-1979, without the logarithmic speeds, and later replaced by NAPM IT2.5-1986 of the National Association of Photographic Manufacturers, which represented the US adoption of the international standard ISO 6. The latest issue of ANSI/NAPM IT2.5 was published in 1993. The standard for color negative film was introduced as ASA PH2.27-1965 and saw a string of revisions in 1971, 1976, 1979 and 1981, before it finally became ANSI IT2.27-1988 prior to its withdrawal. Color reversal film speeds were defined in ANSI PH2.21-1983, which was revised in 1989 before it became ANSI/NAPM IT2.21 in 1994, the US adoption of the ISO 2240 standard. On an international level, the ASA system was superseded by the ISO film speed system between 1982 and 1987, however, the arithmetic ASA speed scale continued to live on as the linear speed value of the ISO system. GOST (Cyrillic: ГОСТ) was an arithmetic film speed scale defined in GOST 2817-45 and GOST 2817-50. It was used in the former Soviet Union since October 1951, replacing Hurter & Driffield (H&D, Cyrillic: ХиД) numbers, which had been used since 1928. GOST 2817-50 was similar to the ASA standard, having been based on a speed point at a density 0.2 above base plus fog, as opposed to the ASA's 0.1. GOST markings are only found on pre-1987 photographic equipment (film, cameras, lightmeters, etc.) of Soviet Union manufacture. This evolved into multiple parts including GOST 10691.6-88 and GOST 10691.5-88, which both became functional on 1 January 1991. The ISO system defines both an arithmetic and a logarithmic scale. The arithmetic ISO scale corresponds to the arithmetic ASA system, where a doubling of film sensitivity is represented by a doubling of the numerical film speed value. In the logarithmic ISO scale, which corresponds to the DIN scale, adding 3° to the numerical value constitutes a doubling of sensitivity. For example, a film rated ISO 200/24° is twice as sensitive as one rated ISO 100/21°. Commonly, the logarithmic speed is omitted; for example, "ISO 100" denotes "ISO 100/21°", while logarithmic ISO speeds are written as "ISO 21°" as per the standard. and rounding to the nearest standard arithmetic speed in Table 1 below. 12 12500/42° 12800 12500 No ISO speeds greater than 10000 have been assigned officially as of 2013. Speeds shown in bold under APEX, ISO and ASA are values actually assigned in speed standards from the respective agencies; other values are calculated extensions to assigned speeds using the same progressions as for the assigned speeds. APEX Sv values 1 to 10 correspond with logarithmic ASA grades 1° to 10° found in ASA PH2.5-1960. ASA arithmetic speeds from 4 to 5 are taken from ANSI PH2.21-1979 (Table 1, p. 8). ASA arithmetic speeds from 6 to 3200 are taken from ANSI PH2.5-1979 (Table 1, p. 5) and ANSI PH2.27-1979. ISO arithmetic speeds from 4 to 3200 are taken from ISO 5800:1987 (Table "ISO speed scales", p. 4). ISO arithmetic speeds from 6 to 10000 are taken from ISO 12232:1998 (Table 1, p. 9). ISO 12232:1998 does not specify speeds greater than 10000. However, the upper limit for Snoise 10000 is given as 12500, suggesting that ISO may have envisioned a progression of 12500, 25000, 50000, and 100000, similar to that from 1250 to 10000. This is consistent with ASA PH2.12-1961. For digital cameras, Nikon, Canon, Sony, Pentax, and Fujifilm apparently chose to express the greater speeds in an exact power-of-2 progression from the highest previously realized speed (6400) rather than rounding to an extension of the existing progression. Most of the modern 35 mm film SLRs support an automatic film speed range from ISO 25/15° to 5000/38° with DX-coded films, or ISO 6/9° to 6400/39° manually (without utilizing exposure compensation). The film speed range with support for TTL flash is smaller, typically ISO 12/12° to 3200/36° or less. The Booster accessory for the Canon Pellix QL (1965) and Canon FT QL (1966) supported film speeds from 25 to 12800 ASA. The film speed dial of the Canon A-1 (1978) supported a speed range from 6 to 12800 ASA (but already called ISO film speeds in the manual). On this camera exposure compensation and extreme film speeds were mutually exclusive. The Leica R8 (1996) and R9 (2002) officially supported film speeds of 8000/40°, 10000/41° and 12800/42° (in the case of the R8) or 12500/42° (in the case of the R9), and utilizing its ±3 EV exposure compensation the range could be extended from ISO 0.8/0° to ISO 100000/51° in half exposure steps. Digital camera manufacturers' arithmetic speeds from 12800 to 409600 are from specifications by Nikon (12800, 25600, 51200, 102400 in 2009, 204800 in 2012, 409600 in 2014), Canon (12800, 25600, 51200, 102400 in 2009, 204800 in 2011, 4000000 in 2015), Sony (12800 in 2009, 25600 in 2010, 409600 in 2014), Pentax (12800, 25600, 51200 in 2010, 102400, 204800 in 2014) and Fujifilm (12800 in 2011). As discussed in the ASA and DIN sections, the definition of the ASA and DIN scales changed several times in the 1950s up into the early 1960s making it necessary to convert between the different scales. Since the ISO system combines the newer ASA and DIN definitions, this conversion is also necessary when comparing older ASA and DIN scales with the ISO scale. The picture shows an ASA/DIN conversion in a 1952 photography book in which 21/10° DIN was converted to ASA 80 instead of ASA 100. Some classic camera's exposure guides show the old conversion as they were valid at the time of production, for example the exposure guide of the classic camera Tessina (since 1957), where 21/10° DIN is related to ASA 80, 18° DIN to ASA 40, etc. Users of classic cameras, who do not know the historic background, may be confused. This value is then rounded to the nearest standard speed in Table 1 of ISO 6:1993. Determining speed for color negative film is similar in concept but more complex because it involves separate curves for blue, green, and red. The film is processed according to the film manufacturer’s recommendations rather than to a specified contrast. ISO speed for color reversal film is determined from the middle rather than the threshold of the curve; it again involves separate curves for blue, green, and red, and the film is processed according to the film manufacturer’s recommendations. Film speed is used in the exposure equations to find the appropriate exposure parameters. Four variables are available to the photographer to obtain the desired effect: lighting, film speed, f-number (aperture size), and shutter speed (exposure time). The equation may be expressed as ratios, or, by taking the logarithm (base 2) of both sides, by addition, using the APEX system, in which every increment of 1 is a doubling of exposure; this increment is commonly known as a "stop". The effective f-number is proportional to the ratio between the lens focal length and aperture diameter, the diameter itself being proportional to the square root of the aperture area. Thus, a lens set to f/1.4 allows twice as much light to strike the focal plane as a lens set to f/2. Therefore, each f-number factor of the square root of two (approximately 1.4) is also a stop, so lenses are typically marked in that progression: f/1.4, 2, 2.8, 4, 5.6, 8, 11, 16, 22, 32, etc. The ISO arithmetic speed has a useful property for photographers without the equipment for taking a metered light reading. Correct exposure will usually be achieved for a frontlighted scene in bright sun if the aperture of the lens is set to f/16 and the shutter speed is the reciprocal of the ISO film speed (e.g. 1/100 second for 100 ISO film). This known as the sunny 16 rule. Exposure index, or EI, refers to speed rating assigned to a particular film and shooting situation in variance to the film's actual speed. It is used to compensate for equipment calibration inaccuracies or process variables, or to achieve certain effects. The exposure index may simply be called the speed setting, as compared to the speed rating. Another example occurs where a camera's shutter is miscalibrated and consistently overexposes or underexposes the film; similarly, a light meter may be inaccurate. One may adjust the EI rating accordingly in order to compensate for these defects and consistently produce correctly exposed negatives. Upon exposure, the amount of light energy that reaches the film determines the effect upon the emulsion. If the brightness of the light is multiplied by a factor and the exposure of the film decreased by the same factor by varying the camera's shutter speed and aperture, so that the energy received is the same, the film will be developed to the same density. This rule is called reciprocity. The systems for determining the sensitivity for an emulsion are possible because reciprocity holds. In practice, reciprocity works reasonably well for normal photographic films for the range of exposures between 1/1000 second to 1/2 second. However, this relationship breaks down outside these limits, a phenomenon known as reciprocity failure. The size of silver halide grains in the emulsion affects film sensitivity, which is related to granularity because larger grains give film greater sensitivity to light. Fine-grain film, such as film designed for portraiture or copying original camera negatives, is relatively insensitive, or "slow", because it requires brighter light or a longer exposure than a "fast" film. Fast films, used for photographing in low light or capturing high-speed motion, produce comparatively grainy images. Kodak has defined a "Print Grain Index" (PGI) to characterize film grain (color negative films only), based on perceptual just-noticeable difference of graininess in prints. They also define "granularity", a measurement of grain using an RMS measurement of density fluctuations in uniformly exposed film, measured with a microdensitometer with 48 micrometre aperture. Granularity varies with exposure — underexposed film looks grainier than overexposed film. Some high-speed black-and-white films, such as Ilford Delta 3200, P3200 T-Max, and T-MAX P3200 are marketed with film speeds in excess of their true ISO speed as determined using the ISO testing method. According to the respective data sheets, the Ilford product is actually an ISO 1000 film, while the Kodak film's speed is nominally 800 to 1000 ISO. The manufacturers do not indicate that the 3200 number is an ISO rating on their packaging. Kodak and Fuji also marketed E6 films designed for pushing (hence the "P" prefix), such as Ektachrome P800/1600 and Fujichrome P1600, both with a base speed of ISO 400. The DX codes on the film cartridges indicate the marketed film speed (ie. 3200), not the ISO speed, in order to automate shooting and development. In digital camera systems, an arbitrary relationship between exposure and sensor data values can be achieved by setting the signal gain of the sensor. The relationship between the sensor data values and the lightness of the finished image is also arbitrary, depending on the parameters chosen for the interpretation of the sensor data into an image color space such as sRGB. For digital photo cameras ("digital still cameras"), an exposure index (EI) rating—commonly called ISO setting—is specified by the manufacturer such that the sRGB image files produced by the camera will have a lightness similar to what would be obtained with film of the same EI rating at the same exposure. The usual design is that the camera's parameters for interpreting the sensor data values into sRGB values are fixed, and a number of different EI choices are accommodated by varying the sensor's signal gain in the analog realm, prior to conversion to digital. Some camera designs provide at least some EI choices by adjusting the sensor's signal gain in the digital realm("expanded ISO"). A few camera designs also provide EI adjustment through a choice of lightness parameters for the interpretation of sensor data values into sRGB; this variation allows different tradeoffs between the range of highlights that can be captured and the amount of noise introduced into the shadow areas of the photo. Digital cameras have far surpassed film in terms of sensitivity to light, with ISO equivalent speeds of up to 4,560,000, a number that is unfathomable in the realm of conventional film photography. Faster processors, as well as advances in software noise reduction techniques allow this type of processing to be executed the moment the photo is captured, allowing photographers to store images that have a higher level of refinement and would have been prohibitively time consuming to process with earlier generations of digital camera hardware. The ISO standard ISO 12232:2006 gives digital still camera manufacturers a choice of five different techniques for determining the exposure index rating at each sensitivity setting provided by a particular camera model. Three of the techniques in ISO 12232:2006 are carried over from the 1998 version of the standard, while two new techniques allowing for measurement of JPEG output files are introduced from CIPA DC-004. Depending on the technique selected, the exposure index rating can depend on the sensor sensitivity, the sensor noise, and the appearance of the resulting image. The standard specifies the measurement of light sensitivity of the entire digital camera system and not of individual components such as digital sensors, although Kodak has reported using a variation to characterize the sensitivity of two of their sensors in 2001. The Standard Output Sensitivity (SOS) technique, also new in the 2006 version of the standard, effectively specifies that the average level in the sRGB image must be 18% gray plus or minus 1/3 stop when the exposure is controlled by an automatic exposure control system calibrated per ISO 2721 and set to the EI with no exposure compensation. Because the output level is measured in the sRGB output from the camera, it is only applicable to sRGB images—typically JPEG—and not to output files in raw image format. It is not applicable when multi-zone metering is used. The CIPA DC-004 standard requires that Japanese manufacturers of digital still cameras use either the REI or SOS techniques, and DC-008 updates the Exif specification to differentiate between these values. Consequently, the three EI techniques carried over from ISO 12232:1998 are not widely used in recent camera models (approximately 2007 and later). As those earlier techniques did not allow for measurement from images produced with lossy compression, they cannot be used at all on cameras that produce images only in JPEG format. The saturation-based (SAT or Ssat) technique is closely related to the SOS technique, with the sRGB output level being measured at 100% white rather than 18% gray. The SOS value is effectively 0.704 times the saturation-based value. Because the output level is measured in the sRGB output from the camera, it is only applicable to sRGB images—typically TIFF—and not to output files in raw image format. It is not applicable when multi-zone metering is used. The two noise-based techniques have rarely been used for consumer digital still cameras. These techniques specify the highest EI that can be used while still providing either an "excellent" picture or a "usable" picture depending on the technique chosen. An update to this standard has now been published ISO 12236:2019. I believe it extends the range of official ISO values https://www.iso.org/obp/ui/#iso:std:iso:12232:ed-3:v1:en gives an overview. is a factor depending on the transmittance T of the lens, the vignetting factor v(θ), and the angle θ relative to the axis of the lens. A typical value is q = 0.65, based on θ = 10°, T = 0.9, and v = 0.98.
is the maximum possible exposure that does not lead to a clipped or bloomed camera output. Typically, the lower limit of the saturation speed is determined by the sensor itself, but with the gain of the amplifier between the sensor and the analog-to-digital converter, the saturation speed can be increased. The factor 78 is chosen such that exposure settings based on a standard light meter and an 18-percent reflective surface will result in an image with a grey level of 18%/√2 = 12.7% of saturation. The factor √2 indicates that there is half a stop of headroom to deal with specular reflections that would appear brighter than a 100% reflecting white surface. The noise-based speed is defined as the exposure that will lead to a given signal-to-noise ratio on individual pixels. Two ratios are used, the 40:1 ("excellent image quality") and the 10:1 ("acceptable image quality") ratio. These ratios have been subjectively determined based on a resolution of 70 pixels per cm (178 DPI) when viewed at 25 cm (9.8 inch) distance. The signal-to-noise ratio is defined as the standard deviation of a weighted average of the luminance and color of individual pixels. The noise-based speed is mostly determined by the properties of the sensor and somewhat affected by the noise in the electronic gain and AD converter. is the exposure that will lead to values of 118 in 8-bit pixels, which is 18 percent of the saturation value in images encoded as sRGB or with gamma = 2.2. The standard specifies how speed ratings should be reported by the camera. If the noise-based speed (40:1) is higher than the saturation-based speed, the noise-based speed should be reported, rounded downwards to a standard value (e.g. 200, 250, 320, or 400). The rationale is that exposure according to the lower saturation-based speed would not result in a visibly better image. In addition, an exposure latitude can be specified, ranging from the saturation-based speed to the 10:1 noise-based speed. If the noise-based speed (40:1) is lower than the saturation-based speed, or undefined because of high noise, the saturation-based speed is specified, rounded upwards to a standard value, because using the noise-based speed would lead to overexposed images. The camera may also report the SOS-based speed (explicitly as being an SOS speed), rounded to the nearest standard speed rating. as well as a user-adjustable SOS value. In all cases, the camera should indicate for the white balance setting for which the speed rating applies, such as daylight or tungsten (incandescent light). Despite these detailed standard definitions, cameras typically do not clearly indicate whether the user "ISO" setting refers to the noise-based speed, saturation-based speed, or the specified output sensitivity, or even some made-up number for marketing purposes. Because the 1998 version of ISO 12232 did not permit measurement of camera output that had lossy compression, it was not possible to correctly apply any of those measurements to cameras that did not produce sRGB files in an uncompressed format such as TIFF. Following the publication of CIPA DC-004 in 2006, Japanese manufacturers of digital still cameras are required to specify whether a sensitivity rating is REI or SOS. As should be clear from the above, a greater SOS setting for a given sensor comes with some loss of image quality, just like with analog film. However, this loss is visible as image noise rather than grain. Current (January 2010) APS and 35mm sized digital image sensors, both CMOS and CCD based, do not produce significant noise until about ISO 1600. ^ a b c d e f DIN 4512:1934-01. Photographische Sensitometrie, Bestimmung der optischen Dichte. Deutscher Normenausschuß (DNA). 1934. In the introduction to the standard, Warnerke's system is described as the first practical system used to measure emulsion speeds, but as being unreliable. In regard to Scheiner's system, it states: "Auch hier erwies sich nach einiger Zeit, daß das Meßverfahren trotz der von Eder vorgenommenen Abänderungen den Anforderungen der Praxis nicht vollständig Rechnung zu tragen vermag, so daß jeder Hersteller […] nach seinem eigenen System die Empfindlichkeit in Scheinergraden ermitteln muß, häufig in sehr primitiver Weise durch […] Vergleich mit Erzeugnissen anderer Hersteller. Die so ermittelten Gebrauchs-Scheinergrade haben mit dem ursprünglich […] ausgearbeiteten Meßverfahren nach Scheiner sachlich nichts mehr zu tun. […] Als Folge hiervon ist allmählich eine Inflation in Empfindlichkeitsgraden eingetreten, für die das Scheiner'sche Verfahren nichts mehr als den Namen hergibt." ^ Progress medal. Royal Photographic Society. Web-page listing people, who have received this award since 1878 ( "Archived copy". Archived from the original on 2012-08-22. Retrieved 2013-04-19. CS1 maint: Archived copy as title (link)): "Instituted in 1878, this medal is awarded in recognition of any invention, research, publication or other contribution which has resulted in an important advance in the scientific or technological development of photography or imaging in the widest sense. This award also carries with it an Honorary Fellowship of The Society. […] 1882 Leon Warnerke […] 1884 J M Eder […] 1898 Ferdinand Hurter and Vero C Driffield […] 1910 Alfred Watkins […] 1912 H Chapman Jones […] 1948 Loyd A Jones […]"
^ Hasluck, Paul Nooncree (1905). The Book of Photography: Practical, Theoretical and Applied. : "THE CHAPMAN JONES PLATE TESTER. A convenient means of testing the colour rendering and other properties of a sensitive plate, or for ascertaining the effect of various colour screens, is afforded by the plate tester devised by Mr. Chapman Jones in 1900. This consists of a number of graduated squares by which the sensitiveness and range of gradation of the plate examined may be determined; a series of squares of different colours and mixtures of colours of equal visual intensity, which will indicate the colour sensitiveness; and a strip of uncoloured space for comparison purposes. It is simply necessary to expose the plate being tested, in contact with the screen, to the light of a standard candle. A suitable frame and stand are supplied for the purpose; any other light may, however, be used if desired. The plate is then developed, when an examination of the negative will yield the desired information. The idea of the coloured squares is based on that of the Abney Colour Sensitometer, where three or four squares of coloured and one of uncoloured glass are brought to an equal visual intensity by backing where necessary with squares of exposed celluloid film developed to suitable density." ^ a b c Lindsay, Arthur (1961). Sowerby, MacRae, ed. Dictionary of Photography: A Reference Book for Amateur and Professional Photographers (19th ed.). London, UK: Iliffe Books Ltd. pp. 582–589. ^ Konovalov, Leonid (2007). Characteristic curve (PDF). Moscow: ВГИК. p. 24. Retrieved 2012-11-09. ^ a b Riat, Martin (Spring 2006). Graphische Techniken - Eine Einführung in die verschiedenen Techniken und ihre Geschichte (PDF) (E-Book) (in German) (3rd German ed.). Burriana. , based on a Spanish book: Riat, Martin (September 1983). Tecniques Grafiques: Una Introduccio a Les Diferents Tecniques I a La Seva Historia (in Spanish) (1st ed.). Aubert. ISBN 84-86243-00-9. ^ Biltz, Martin (1933). "Über DIN-Grade, das neue deutsche Maß der photographischen Empfindlichkeit". Naturwissenschaften (in German). Springer. 21 (41): 734–736. doi:10.1007/BF01504271. : "[…] Im folgenden soll an Hand der seither gebräuchlichen sensitometrischen Systeme nach Scheiner […], nach Hurter und Driffield […] und nach Eder und Hecht [de] […] kurz gezeigt werden, wie man bisher verfahren ist. Im Anschlusse daran wird das neue vom Deutschen Normenausschusse für Phototechnik auf Empfehlung des Ausschusses für Sensitometrie der Deutschen Gesellschaft für photographische Forschung vorgeschlagene System […] betrachtet werden. […]". ^ Heisenberg, E. (1930). "Mitteilungen aus verschiedenen Gebieten – Bericht über die Gründung und erste Tagung der Deutschen Gesellschaft für photographische Forschung (23. bis 25. Mai 1930)". Naturwissenschaften (in German). Springer. 18 (52): 1130–1131. doi:10.1007/BF01492990. : "[…] Weitere 3 Vorträge von Prof. Dr. R. Luther, Dresden, Prof. Dr. Lehmann, Berlin, Prof. Dr. Pirani, Berlin, behandelten die Normung der sensitometrischen Methoden. Zu normen sind: die Lichtquelle, die Art der Belichtung (zeitliche oder Intensitätsabstufung), die Entwicklung, die Auswertung. Auf den Internationalen Kongressen in Paris 1925 und London 1928 sind diese Fragen schon eingehend behandelt und in einzelnen Punkten genaue Vorschläge gemacht worden. Die Farbtemperatur der Lichtquelle soll 2360° betragen. Vor dieselbe soll ein Tageslichtfilter, welches vom Bureau of Standards ausgearbeitet worden ist, geschaltet werden. Herr Luther hat an der Filterflüssigkeit durch eigene Versuche gewisse Verbesserungen erzielt. Schwierigkeiten bereitet die Konstanthaltung der Farbtemperatur bei Nitralampen. Herr Pirani schlug deshalb in seinem Vortrag die Verwendung von Glimmlampen vor, deren Farbe von der Stromstärke weitgehend unabhängig ist. In der Frage: Zeit- oder Intensitätsskala befürworten die Herren Luther und Lehmann die Intensitätsskala. Herr Lehmann behandelte einige Fragen, die mit der Herstellung der Intensitätsskala zusammenhängen. Ausführlicher wurde noch die Auswertung (zahlenmäßige Angabe der Empfindlichkeit und Gradation) besprochen, die eine der wichtigsten Fragen der Sensitometrie darstellt. In der Diskussion wurde betont, daß es zunächst nicht so sehr auf eine wissenschaftlich erschöpfende Auswertung ankomme als darauf, daß die Empfindlichkeit der Materialien in möglichst einfacher, aber eindeutiger und für den Praktiker ausreichender Weise charakterisiert wird. […]". ^ a b Voss, Waltraud (2002-03-12). "Robert Luther – der erste Ordinarius für Wissenschaftliche Photographie in Deutschland - Zur Geschichte der Naturwissenschaften an der TU Dresden (12)" (PDF). Dresdner UniversitätsJournal. 13 (5): 7. : "[…] Luther [de] war Mitglied des Komitees zur Veranstaltung internationaler Kongresse für wissenschaftliche und angewandte Photographie; die Kongresse 1909 und 1931 in Dresden hat er wesentlich mit vorbereitet. 1930 gehörte er zu den Mitbegründern der Deutschen Gesellschaft für Photographische Forschung. Er gründete und leitete den Ausschuss für Sensitometrie der Gesellschaft, aus dessen Tätigkeit u.a. das DIN-Verfahren zur Bestimmung der Empfindlichkeit photographischer Materialien hervorging. […]"
^ a b Buckland, Michael Keeble (2008). "The Kinamo movie camera, Emanuel Goldberg and Joris Ivens" (PDF). Film History (Preprint ed.). 20 (1): 49–58. : "Ivens returned to Dresden in August 1931 to attend the VIII International Congress of Photography, organised by Goldberg; John Eggert [de], head of research at the Agfa plant in Wolfen, near Leipzig; and Robert Luther [de], the founding Director of the Institute for Scientific Photography at the Technical University in Dresden and Goldberg's dissertation advisor. The proceedings were heavily technical and dominated by discussion of the measurement of film speeds. The Congress was noteworthy because a film speed standard proposed by Goldberg and Luther was approved and, in Germany, became DIN 4512, […]"
^ Eggert, John; von Biehler, Arpad, eds. (1932). "Bericht über den VIII. Internationalen Kongreß für wissenschaftliche und angewandte Photographie Dresden 1931" (in German). Leipzig: J. A. Barth-Verlag. ^ Benser, Walther (1957). Wir photographieren farbig (in German). Europäischer Buchklub. p. 10. ^ a b c ISO 6:1993: Photography – Black-and-white pictorial still camera negative film/process systems – Determination of ISO speed. ^ a b ISO 2240:2003: Photography – Colour reversal camera films – Determination of ISO speed. ^ a b ISO 5800:1987: Photography – Colour negative films for still photography – Determination of ISO speed. ^ Mulhern, Charles J. (1990-06-15). Letter to John D. de Vries (Copyscript on John D. de Vries' web-site). Archived from the original on 2013-01-03. : "In 1931, Edward Faraday Weston applied for a U.S patent on the first Weston Exposure meter, which was granted patent No. 2016469 on October 8, 1935, also an improved version was applied for and granted U.S patent No. 2042665 on July 7th 1936. From 1932 to around 1967, over 36 varieties of Weston Photographic Exposure Meters were produced in large quantities and sold throughout the world, mostly by Photographic dealers or agents, which also included the Weston film speed ratings, as there were no ASA or DIN data available at that time." ^ Roseborough, Everett (1996). "The Contributions of Edward W. Weston and his company". Photographic Canadiana. 22 (3). ^ Tipper, Martin. "Weston — The company and the man". www.westonmeter.org.uk, a web-page on Weston exposure meters. : "[…] the Weston method of measuring film speeds. While it had some shortcomings it had the advantage of being based on a method which gave practical speeds for actual use and it was independent of any film manufacturer. Previous speed systems such as the H&D and early Scheiner speeds were both threshold speeds and capable of considerable manipulation by manufacturers. Weston's method measured the speed well up on the curve making it more nearly what one would get in actual practice. (This means that he was a bit less optimistic about film sensitivity than the manufacturers of the day who were notorious for pretending their films were more sensitive than they really were.) A certain Mr. W. N. Goodwin of Weston is usually credited with this system." ^ Hefley, Harold M. (1951). "A method of calculating exposures for photomicrographs" (PDF). Arkansas Academy of Science Journal. University of Arkansas, Fayetteville, USA (4). , research paper on an exposure system for micro-photography based on a variation of Weston film speed ratings. ^ Weston film ratings — Weston system of emulsion ratings (Booklet, 16 pages). Newark, USA: Weston. 1946. : ‘You cannot necessarily depend on Weston speed values from any other source unless they are marked "OFFICIAL WESTON SPEEDS BY AGREEMENT WITH THE WESTON ELECTRICAL INSTRUMENT CORPORATION"’. ^ a b c Weston ratings (Booklet, 20 pages). Enfield, UK: Sangamo Weston. 1956. : "WESTON RATINGS—Correct exposure depends on two variables: (1) the available light and (2) its effect on the film in use. WESTON have always considered these two to be of equal importance and therefore introduced their own system of film ratings. Subsequently this system was found to be so successful that it was widely accepted in photographic circles and formed the basis for internationally agreed standards." ^ GW-68. Manual. USA: General Electric. GES-2810. : The manual states that ASA was working on standardized values, but none had been established at this time. ^ a b c General Electric Film Values (Leaflet, 12 pages). USA: General Electric. 1947. General Electric publication code GED-744. : "This General Electric Film Value Booklet contains the […] exposure-index numbers for […] photographic films in accordance with the new system for rating photographic films that has been devised by the American Standards Association. This system has been under development for several years and is the result of co-operative effort on the part of all the film manufacturers, meter manufacturers, the Optical Society of America, and the Bureau of Standards. It was used by all of the military services during the war. The new ASA exposure-index numbers provide the photographer with the most accurate film-rating information that has yet been devised. The G-E exposure meter uses the ASA exposure-index numbers, not only in the interest of standardization, but also because this system represents a real advancement in the field of measurement. The exposure-index number have been so arranged that all earlier model G-E meters can be used with this series of numbers. For some films the values are exactly the same; and where differences exist, the new ASA exposure-index value will cause but a slight increase in exposure. However […] a comparison of the new ASA exposure-index numbers and the G-E film values is shown […] A complete comparison of all systems of emulsion speed values can be found in the G-E Photo Data Book. […] All G-E meters manufactured after January, 1946, utilize the ASA exposure indexes. Although the new ASA values can be used with all previous model G-E meters, interchangeable calculator-hoods with ASA exposure indexes are available for Types DW-48, DW-49, and DW-58 meters." ^ General Electric Photo Data Book. General Electric. GET-I717. ^ General Electric (1946). "Attention exposure meter owners" (Advertisement). : "Attention! Exposure meter owners! 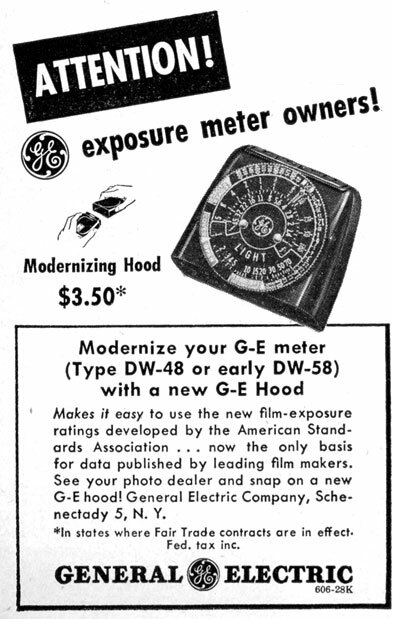 Modernizing Hood $3.50 […] Modernize your G-E meter (Type DW-48 or early DW-58) with a new G-E Hood. Makes it easy to use the new film-exposure ratings developed by the American Standards Association … now the only basis for data published by leading film makers. See your photo dealer and snap on a new G-E hood! General Electric Company, Schenectady 5, N.Y.". ^ a b Gorokhovskiy, Yu. N. (1970). Fotograficheskaya metrologiya. Uspekhi Nauchnoy Fotografii (Advances in Scientific Photography) (in Russian). 15: 183–195. (English translation: Photographic Metrology (PDF) (NASA Technical Translation II F-13,921, National Aeronautics and Space Administration, Washington, D.C. 20546). November 1972. ). ^ GOST 2817-50 Transparent sublayer photographic materials. Method of general sensitometric test. : GOST 2817-45 was replaced by GOST 2817-50, which in turn was replaced by GOST 10691.6-88, which defines black-and-white films, whereas GOST 10691.5-88 defines black-and-white films for aerial photography. ^ Stroebel, Leslie D.; Zakia, Richard D. (1993). The Focal Encyclopedia of Photography (3rd ed.). Focal Press. p. 304. ISBN 978-0-240-51417-8. ^ завод [Zavod], Красногорский [Krasnogorskiy]. "Questions and answers: Film speeds" (in Russian). Retrieved 2011-08-06. ^ GOST 10691.6-88 Black-and-white phototechnical films, films for scientific researches and industry. Method for determination of speed numbers. ^ GOST 10691.5-88 Black-and-white aerophotographic films. Method for determination of speed numbers. ^ a b Jacobson, R. E.; Ray, Sidney F.; Attridge, Geoffrey G.; Axford, Norman R. (2000). The manual of photography (9th ed.). Focal Press. pp. 305–307. ISBN 978-0-240-51574-8. ^ Graves, Carson (1996). The zone system for 35mm photographers. Focal Press. p. 124. ISBN 978-0-240-80203-9. ^ "ISO 2721:1982. Photography — Cameras — Automatic controls of exposure" (paid download). Geneva: International Organization for Standardization. Archived from the original on 2008-08-07. ^ a b c d e f Leica Camera AG (2002). Leica R9 Bedienungsanleitung / Instructions. Leica publication 930 53 VII/03/GX/L, Solms, Germany, p. 197: "Film speed range: Manual setting from ISO 6/9° to ISO 12500/42° (with additional exposure compensation of up to ±3 EV, overall films from ISO 0.8/0° to ISO 100000/51° can be exposed), DX scanning from ISO 25/15° to ISO 5000/38°.". Accessed 2011-07-30. ^ a b c d e f Leica Camera AG (1996). Leica Instructions - Leica R8. Solms, Germany, p. 16: ‘The DX-setting for automatic speed scanning appears after the position "12800".’ and p. 65: "Film speed range: Manual setting from ISO 6/9° to ISO 12,800/42°. (With additional override of −3 EV to +3 EV, films from 0 DIN to 51 DIN can be exposed as well.) DX scanning from ISO 25/15° to ISO 5000/38°.". Accessed 2011-07-30. ^ a b "KODAK PROFESSIONAL T-MAX Films" (PDF). wwwuk.kodak.com. Kodak. Retrieved 7 October 2018. ^ a b "KODAK PROFESSIONAL T-MAX P3200 Black & White Negative Film" (PDF). imaging.kodakalaris.com. KodakAlaris. Retrieved 7 October 2018. ^ a b c ASA PH2.12-1961, Table 2, p. 9, showed (but did not specify) a speed of 12500 as the next full step greater than 6400. ^ a b Canon. Additional Information on: Canon FT QL Camera: "Acceptable film speed has been increased to a range of between ASA 25 and an incredible ASA 12,800 by the use of the CANON BOOSTER. The light-measuring range of the newly developed CANON FT QL has been extended from a low of EV −3.5, f/1.2 15 seconds to EV 18 with ASA 100 film. This is the first time a TTL camera has been capable of such astonishing performance." ^ a b c d e Nikon USA Web page for Nikon D3s Archived 2012-04-09 at WebCite. Accessed 2010-01-11. ^ a b c d e Canon USA Web page for Canon EOS-1D Mark IV. Accessed 2010-01-11. ^ a b Canon USA Web page for Canon EOS-1D X. Accessed October 2011. ^ a b Nikon D4 page for Nikon D4. Accessed 2012-01-06. ^ a b c Canon Deutschland (2015-07-30). "Unsichtbares wird sichtbar! Canon präsentiert die ME20F-SH für Full-HD Farbvideos bei extrem wenig Licht". Press release (in German). Retrieved 2015-07-30. ^ Sony Europe Web page for DSLR-A500/DSLR-A550 (2009-08-27): "Dramatically reduced picture noise now allows super-sensitive shooting at up to ISO 12800, allowing attractive results when shooting handheld in challenging situations like candlelit interiors.". Accessed 2011-07-30. ^ Sony Europe Web page for DSLR-A560/DSLR-A580 Archived 2010-08-30 at the Wayback Machine (2010-08-27): "Multi-frame Noise Reduction ‘stacks' a high-speed burst of six frames, creating a single low-noise exposure that boosts effective sensitivity as high as ISO 25600.". Accessed 2011-07-30. ^ Pentax USA Web page for Pentax K-5 (2010): "ISO Sensitivity: ISO 100-12800 (1, 1/2, 1/3 steps), expandable to ISO 80–51200". Accessed 2011-07-29. ^ Fujifilm Canada Web page for Fuji FinePix X100 (2011-02): "Extended output sensitivity equivalent ISO 100 or 12800". Accessed 2011-07-30. ^ a b 戴淮清 《摄影入门》 (in Chinese). Singapore. 1952. ^ Lambrecht, Ralph W.; Woodhouse, Chris (2003). Way Beyond Monochrome. Newpro UK Ltd. p. 113. ISBN 978-0-86343-354-2. ^ "Kodak Tech Pub E-58: Print Grain Index". Eastman Kodak, Professional Division. July 2000. ^ "Delta 3200 Professional – technical information". ilfordphoto.com. Harman technology. May 2010. Retrieved May 3, 2018. ^ Fact Sheet, Delta 3200 Professional. Knutsford, U.K.: Ilford Photo. ^ a b c d e f ISO 12232:2006. Photography — Digital still cameras — Determination of exposure index, ISO speed ratings, standard output sensitivity, and recommended exposure index (paid download). Geneva: International Organization for Standardization Archived 2008-08-07 at the Wayback Machine. ^ CIPA DC-004. Sensitivity of digital cameras. Tokyo: Camera & Imaging Products Association. ^ Kodak Image Sensors – ISO Measurement. Rochester, NY: Eastman Kodak. ^ "Exchangeable image file format for digital still cameras: Exif Version 2.3" (PDF). CIPA. Retrieved 2014-12-05. ^ New Measures of the Sensitivity of a Digital Camera. Douglas A. Kerr, 2007-08-30. ^ ISO 12232:1998. Photography — Electronic still-picture cameras — Determination of ISO speed, p. 12. ^ "D200 Users manual" (PDF). Nikon. Retrieved 2015-09-20. ISO 6:1974, ISO 6:1993 (1993-02). Photography — Black-and-white pictorial still camera negative film/process systems — Determination of ISO speed. Geneva: International Organization for Standardization. ISO 2240:1982 (1982-07), ISO 2240:1994 (1994-09), ISO 2240:2003 (2003–10). Photography — Colour reversal camera films — Determination of ISO speed. Geneva: International Organization for Standardization. ISO 2720:1974. General Purpose Photographic Exposure Meters (Photoelectric Type) — Guide to Product Specification. Geneva: International Organization for Standardization. ISO 5800:1979, ISO 5800:1987 (1987-11), ISO 5800:1987/Cor 1:2001 (2001–06). Photography — Colour negative films for still photography — Determination of ISO speed. Geneva: International Organization for Standardization. ISO 12232:1998 (1998-08), ISO 12232:2006 (2006-04-15), ISO 12232:2006 (2006-10-01). Photography — Digital still cameras — Determination of exposure index, ISO speed ratings, standard output sensitivity, and recommended exposure index. Geneva: International Organization for Standardization. ASA Z38.2.1-1943, ASA Z38.2.1-1946, ASA Z38.2.1-1947 (1947-07-15). American Standard Method for Determining Photographic Speed and Speed Number. New York: American Standards Association. Superseded by ASA PH2.5-1954. ASA PH2.5-1954, ASA PH2.5-1960. American Standard Method for Determining Speed of photographic Negative Materials (Monochrome, Continuous Tone). New York: United States of America Standards Institute (USASI). Superseded by ANSI PH2.5-1972. ANSI PH2.5-1972, ANSI PH2.5-1979 (1979-01-01), ANSI PH2.5-1979(R1986). Speed of photographic negative materials (monochrome, continuous tone, method for determining). New York: American National Standards Institute. Superseded by NAPM IT2.5-1986. NAPM IT2.5-1986, ANSI/ISO 6-1993 ANSI/NAPM IT2.5-1993 (1993-01-01). Photography — Black-and-White Pictorial Still Camera Negative Film/Process Systems — Determination of ISO Speed (same as ANSI/ISO 6-1993). National Association of Photographic Manufacturers. This represents the US adoption of ISO 6. ASA PH2.12-1957, ASA PH2.12-1961. American Standard, General-Purpose Photographic Exposure Meters (photoelectric type). New York: American Standards Association. Superseded by ANSI PH3.49-1971. ANSI PH2.21-1983 (1983-09-23), ANSI PH2.21-1983(R1989). Photography (Sensitometry) Color reversal camera films - Determination of ISO speed. New York: American Standards Association. Superseded by ANSI/ISO 2240-1994 ANSI/NAPM IT2.21-1994. ANSI/ISO 2240-1994 ANSI/NAPM IT2.21-1994. Photography - Colour reversal camera films - determination of ISO speed. New York: American National Standards Institute. This represents the US adoption of ISO 2240. ASA PH2.27-1965 (1965-07-06), ASA PH2.27-1971, ASA PH2.27-1976, ANSI PH2.27-1979, ANSI PH2.27-1981, ANSI PH2.27-1988 (1988-08-04). Photography - Colour negative films for still photography - Determination of ISO speed (withdrawn). New York: American Standards Association. Superseded by ANSI IT2.27-1988. ANSI IT2.27-1988 (1994-08/09?). Photography Color negative films for still photography - Determination of ISO speed. New York: American National Standards Institute. Withdrawn. This represented the US adoption of ISO 5800. ANSI PH3.49-1971, ANSI PH3.49-1971(R1987). American National Standard for general-purpose photographic exposure meters (photoelectric type). New York: American National Standards Institute. After several revisions, this standard was withdrawn in favor of ANSI/ISO 2720:1974. ANSI/ISO 2720:1974, ANSI/ISO 2720:1974(R1994) ANSI/NAPM IT3.302-1994. General Purpose Photographic Exposure Meters (Photoelectric Type) — Guide to Product Specification. New York: American National Standards Institute. This represents the US adoption of ISO 2720. BSI BS 1380:1947, BSI BS 1380:1963. Speed and exposure index. British Standards Institution. Superseded by BSI BS 1380-1:1973 (1973-12), BSI BS 1380-2:1984 (1984-09), BSI BS 1380-3:1980 (1980-04) and others. BSI BS 1380-1:1973 (1973-12-31). Speed of sensitized photographic materials: Negative monochrome material for still and cine photography. British Standards Institution. Replaced by BSI BS ISO 6:1993, superseded by BSI BS ISO 2240:1994. BSI BS 1380-2:1984 ISO 2240:1982 (1984-09-28). Speed of sensitized photographic materials. Method for determining the speed of colour reversal film for still and amateur cine photography. British Standards Institution. Superseded by BSI BS ISO 2240:1994. BSI BS 1380-3:1980 ISO 5800:1979 (1980-04-30). Speed of sensitized photographic materials. Colour negative film for still photography. British Standards Institution. Superseded by BSI BS ISO 5800:1987. BSI BS ISO 6:1993 (1995-03-15). Photography. Black-and-white pictorial still camera negative film/process systems. Determination of ISO speed. British Standards Institution. This represents the British adoption of ISO 6:1993. BSI BS ISO 2240:1994 (1993-03-15), BSI BS ISO 2240:2003 (2004-02-11). Photography. Colour reversal camera films. Determination of ISO speed. British Standards Institution. This represents the British adoption of ISO 2240:2003. BSI BS ISO 5800:1987 (1995-03-15). Photography. Colour negative films for still photography. Determination of ISO speed. British Standards Institution. This represents the British adoption of ISO 5800:1987. DIN 4512:1934-01, DIN 4512:1957-11 (Blatt 1), DIN 4512:1961-10 (Blatt 1). Photographische Sensitometrie, Bestimmung der optischen Dichte. Berlin: Deutscher Normenausschuß (DNA). Superseded by DIN 4512-1:1971-04, DIN 4512-4:1977-06, DIN 4512-5:1977-10 and others. DIN 4512-1:1971-04, DIN 4512-1:1993-05. Photographic sensitometry; systems of black and white negative films and their process for pictorial photography; determination of speed. Berlin: Deutsches Institut für Normung (before 1975: Deutscher Normenausschuß (DNA)). Superseded by DIN ISO 6:1996-02. DIN 4512-4:1977-06, DIN 4512-4:1985-08. Photographic sensitometry; determination of the speed of colour reversal films. Berlin: Deutsches Institut für Normung. Superseded by DIN ISO 2240:1998-06. DIN 4512-5:1977-10, DIN 4512-5:1990-11. Photographic sensitometry; determination of the speed of colour negative films. Berlin: Deutsches Institut für Normung. Superseded by DIN ISO 5800:1998-06. DIN ISO 6:1996-02. Photography - Black-and-white pictorial still camera negative film/process systems - Determination of ISO speed (ISO 6:1993). Berlin: Deutsches Institut für Normung. This represents the German adoption of ISO 6:1993. DIN ISO 2240:1998-06, DIN ISO 2240:2005-10. Photography - Colour reversal camera films - Determination of ISO speed (ISO 2240:2003). Berlin: Deutsches Institut für Normung. This represents the German adoption of ISO 2240:2003. DIN ISO 5800:1998-06, DIN ISO 5800:2003-11. Photography - Colour negative films for still photography - Determination of ISO speed (ISO 5800:1987 + Corr. 1:2001). Berlin: Deutsches Institut für Normung. This represents the German adoption of ISO 5800:2001. Leslie B. Stroebel, John Compton, Ira Current, Richard B. Zakia. Basic Photographic Materials and Processes, second edition. Boston: Focal Press, 2000. ISBN 0-240-80405-8. Wikimedia Commons has media related to Film speed.